Ok, I’ll admit, I totally failed on predicting the gender of my baby! I laugh now when I think back to how certain I was that I was having a girl. In fact, when Alexander was born and my husband announced ‘It’s a boy’ my first word was ‘WHAT?!!’. Sure enough, baby Alexander proved all the old wives tales wrong and surprised us all. 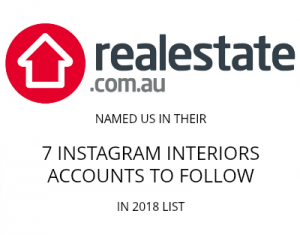 So for the past few months I’ve been taking down all the pink, flowery decor and replacing it with more gender neutral sage tones and Australian inspired pieces. 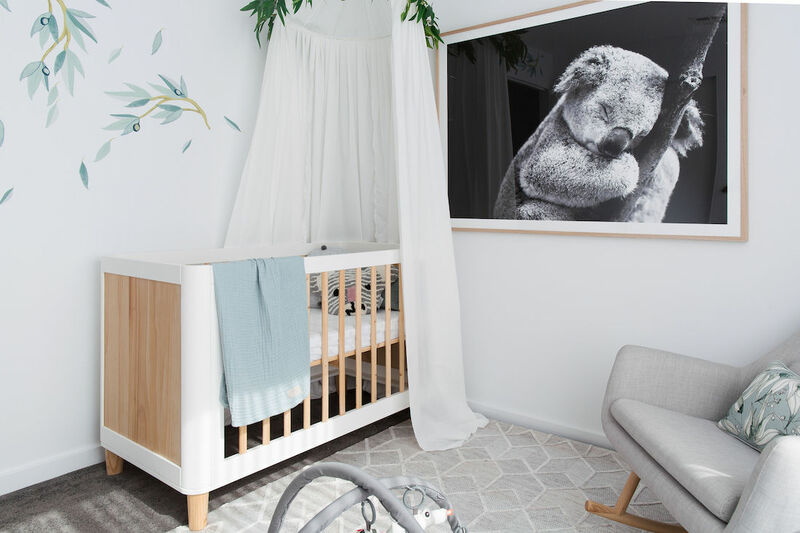 The oversized koala photography framed artwork I found at OZ Design Furniture became the launching point for Alexander’s nursery. I instantly fell in love with the gentle energy of this piece that reminded me so much of Alexander’s sleepy nature. From there, I thought why not continue with an Australian theme? Outside his window are giant gum trees so bringing elements of the surrounds into this space appealed to me. I found a eucalyptus leaf and gumnut cushion from Pillow Talk with soft sage tones that set the colour palette for the space. 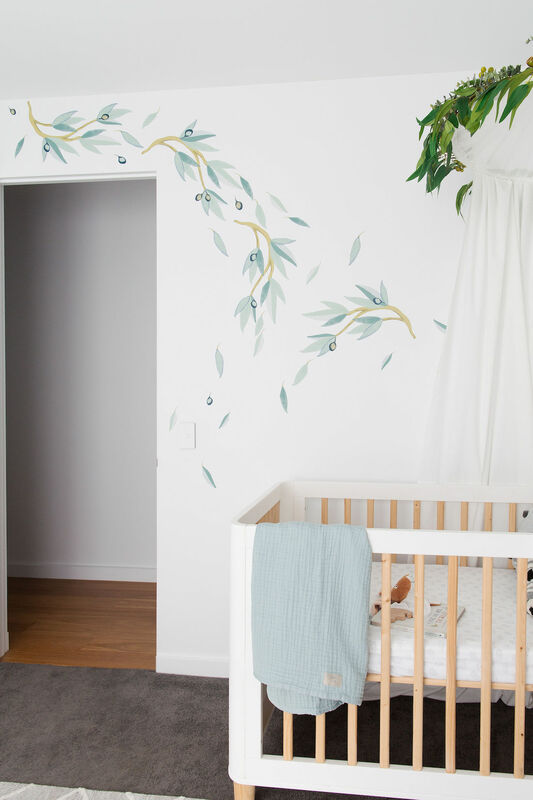 The Cam Cam blanket (draped over the cot) and change mat from Dane Studio and eucalyptus leaf wall decal from Blond Noir further picked up on these colours. 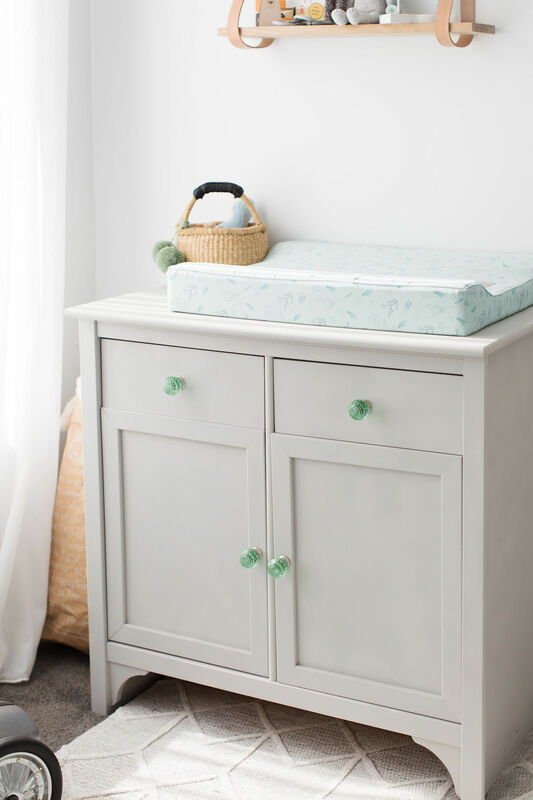 You may recall a few months ago I upcycled an old $20 chest from the Salvos which I’m using as his change table. Of course, because I thought I was having a girl I used sweet coral coloured door handles so I switched these over for soft green handles I bought on Etsy. 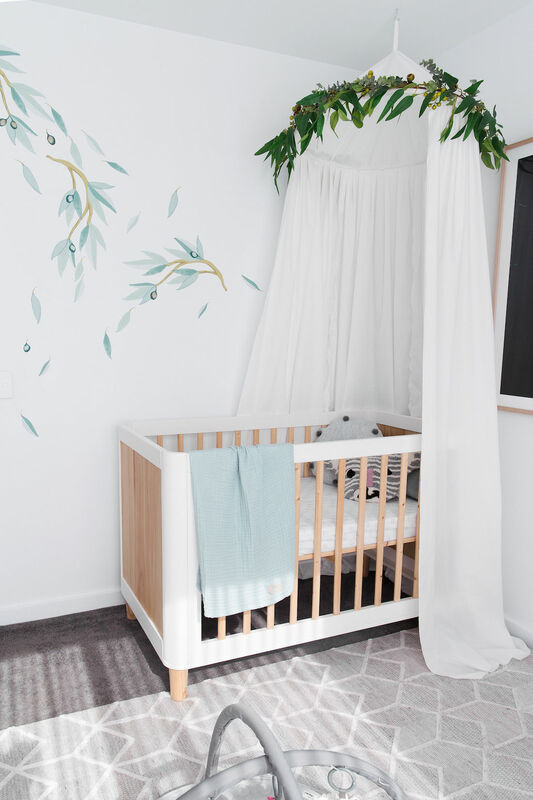 The cot is the same Incy cot I used for Patrick and I used an echidna cot sheet and hung the oversized cot canopy I made with eucalyptus garland to tie into this space. I did treat myself to a rocking chair though as I suffered terrible back pain after having Patrick that I think had a lot to do with all the feeding I did where my back wasn’t supported. 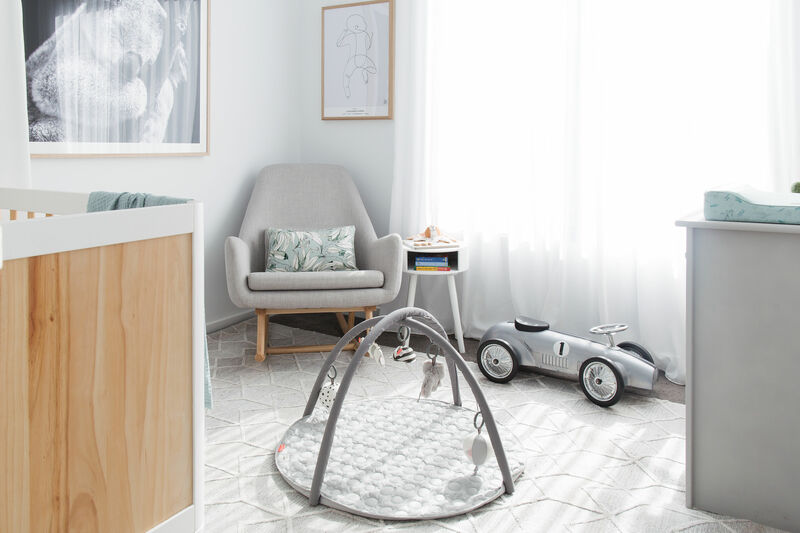 This large Scandi style rocking chair from Adairs is wide enough to fit me and Patrick so I can read a book to him while feeding Alexander or he can sit with us and feel included. Next to it is a simple white side table I bought from Kmart a few years ago. 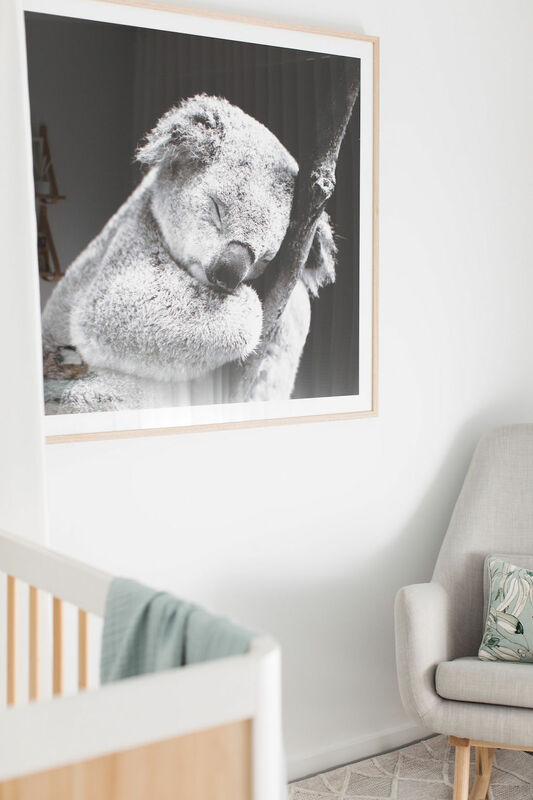 I mentioned that the koala photography artwork was the starting point for this space and it takes up the full wall you see as you enter. I’m a big believer in filling walls to draw your eye up and around a space. On the little wall above the rocking chair I hung an illustration from Little Leggs which has all of Alexander’s birth details (time of birth, length, weight and full name). I love the simplicity of this piece. 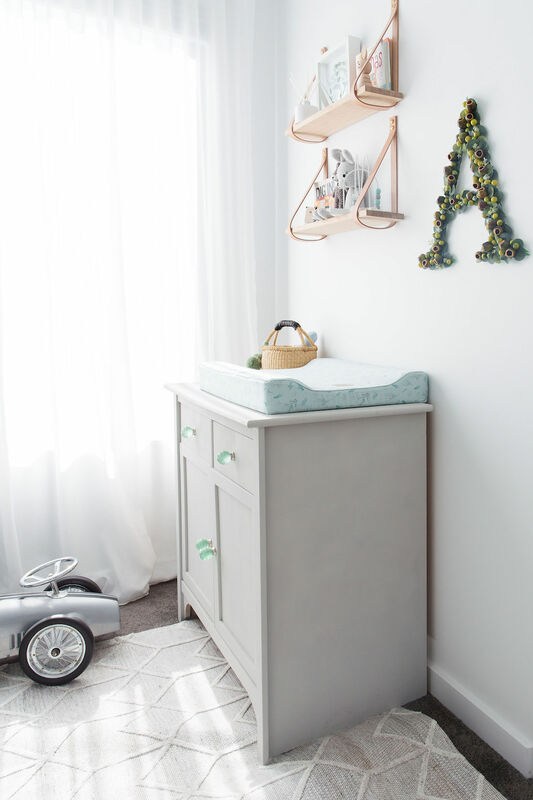 Above the dresser/change table, I installed two small natural leather shelves from Interior Motives. They’re just the right size and I’m sure I’ll have fun constantly changing up what’s displayed here. 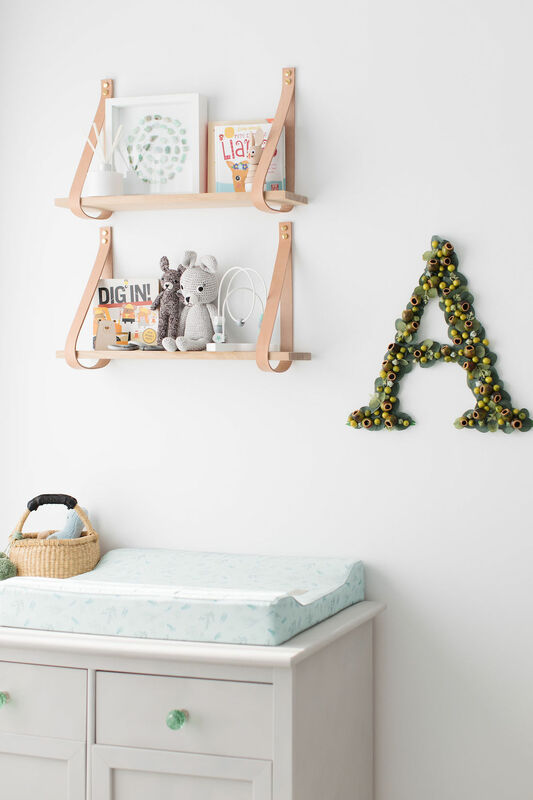 Just next to these shelves is a monogram A that I made using artificial leaves from Koch & Co. You may recall I previously made a floral B for that baby girl I never ended up having, ha ha. One of my favourite features in this room though are the removable vinyl wall decals I got from Blond Noir. These come as individual pieces on sheets so you can create whatever pattern you like. I arranged them in a way that reminded me of a breeze blowing through the room. To lighten the space and add texture I found this beautiful large area rug from Rugs of Beauty. 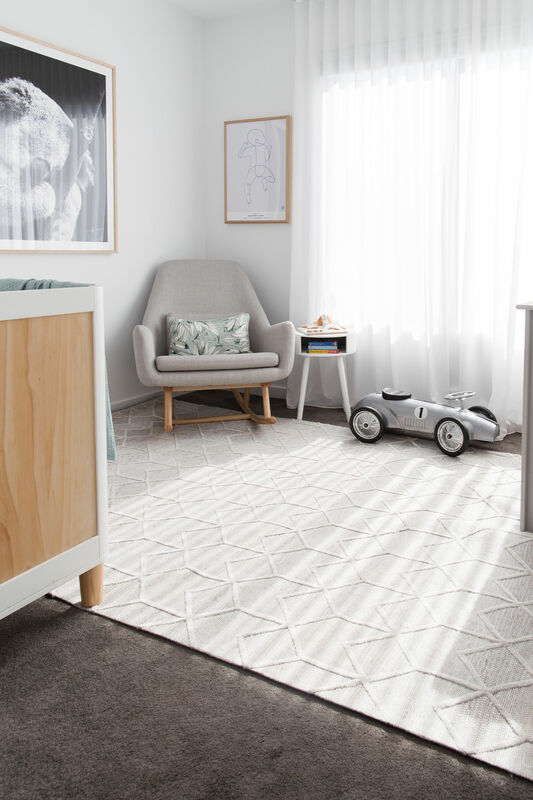 Some people can’t do rugs on carpet but I do it all the time and love how this rug anchors the space (and hides most of the carpet which I don’t particularly love). On the ground I also have a Done by Deer baby play gym from Wiggles Piggles. 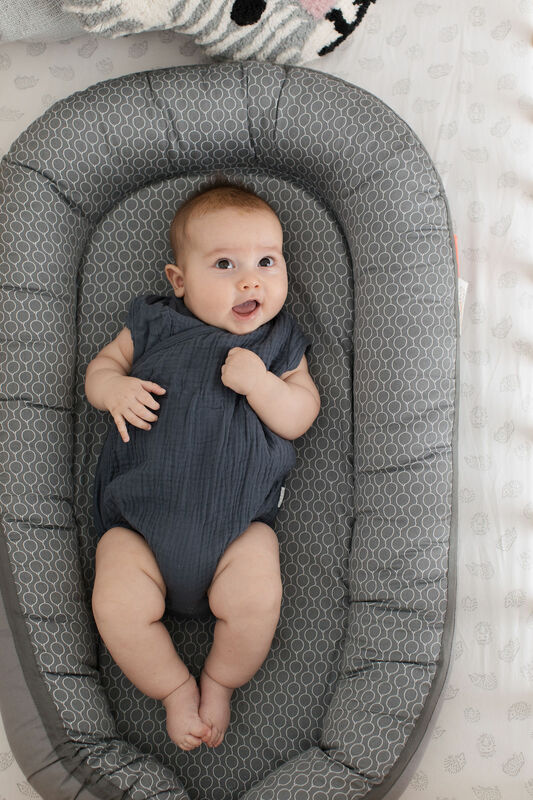 I much prefer this stylish grey play gym to the lime green one I had for Patrick! Alexander loves playing in here every day. To finish off the space I added a few more decorative pieces around the room. In the cot, I used a trio of cushions. 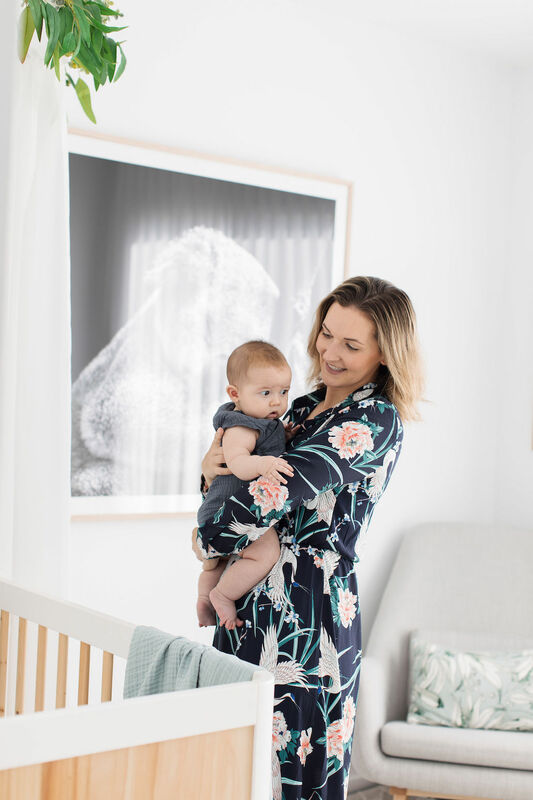 The pom pom cushion is from Home Love Interiors (also a great place to find beautiful toys and gifts), and the koala cushion and velvet sage cushion are from My House Loves. The little woven basket next to the change mat is from Frank and Sage and in the shelves I added a range of pieces from places like Bloomingville and Miann and Co.
No doubt I’ll continue to add to this space and change things about as Alexander grows but for now I love this room and hope you do too. If you have any questions about items I used in here that I didn’t mention, just post a comment below and I’ll answer back. Next article7 Valentine’s Day shopping ideas, shop our top picks! Beautiful G! 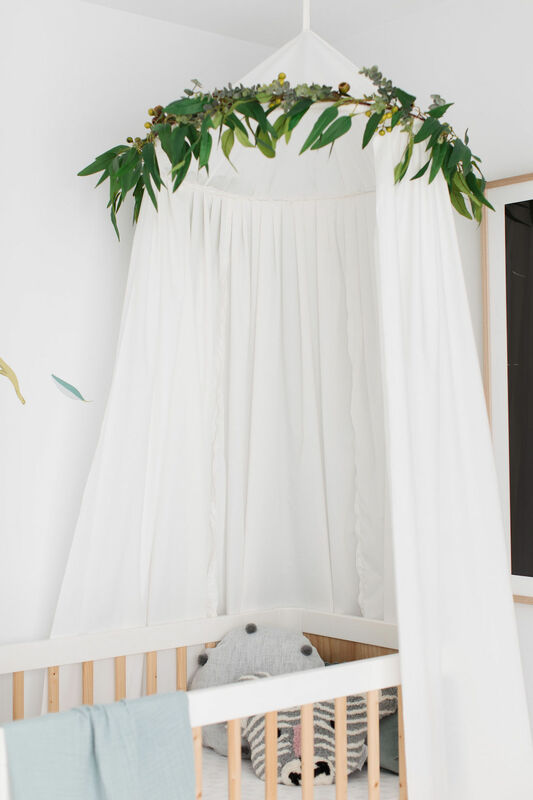 I love the eucalyptus garland and koala pic the best. A looks like a little gumnut baby, delicious! !